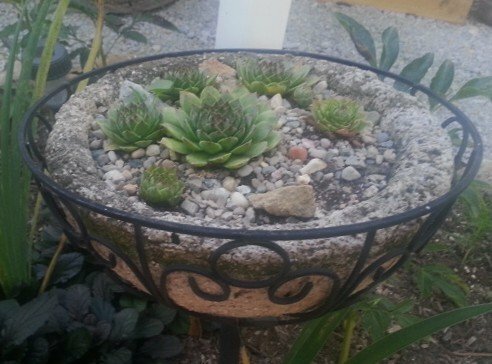 How many times do you see a succulent plant and want to know its name? Someone is always asking for help identifying a succulent or sedum. I am rarely any help even if I may have seen a plant so many times, but I cannot remember the name…if I ever even knew it in the first place. And I know a scientific name in a few instances, if at all. 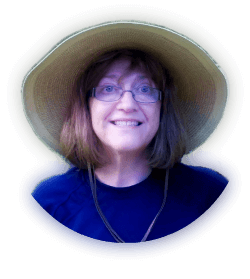 I think that my pages should include photos of some of my plant varieties that I have planted and that you may want to plant too. So I will plan on including the names if known. 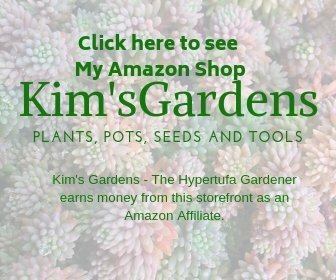 You will find so many plants that you will love! Each year I say that I am not getting any tender succulents that I have to bring inside. 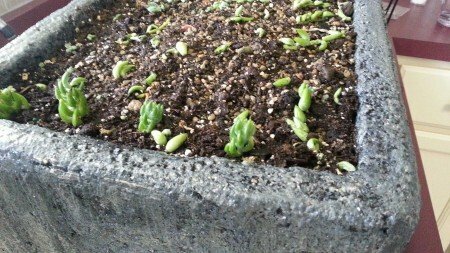 It’s just too hard for me to keep them healthy until the following spring. But what do I do? Get a pretty plant which I know will possibly need to come inside. I tell myself I will just enjoy it for the summer, but no! Each time, in the fall, I end up setting up shelves and lights in the basement. 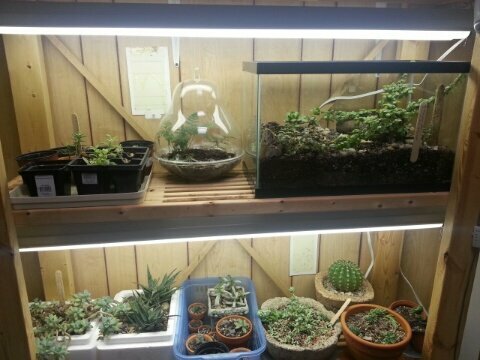 I try to keep all of them alive and healthy so that I can put them back outside the following year. But they never do as well inside and it is discouraging. But you can increase your collection by propagating your existing plants and get a head start on the new year. 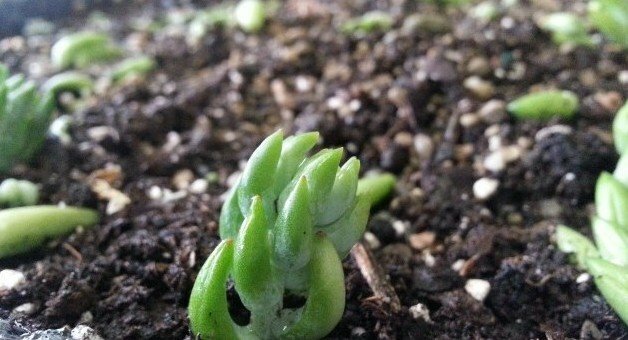 These cuttings of donkey tail sedum (sedum morganianum) are so easy to propagate. Each of the little “beans” that fall off can be stuck into a gritty soil mix and will quickly take root and give you a new plant. I don’t have a lot of luck with aloes. I had one bloom late last fall but it must have been its last attempt to survive. I know there is something more that I should have done, but it eludes me and I will just have to keep reading and studying to figure that out. Meanwhile I just have to stay away from them until I learn more. But I will just keep at it because it is just what I do. How are all your plants coming along this year? 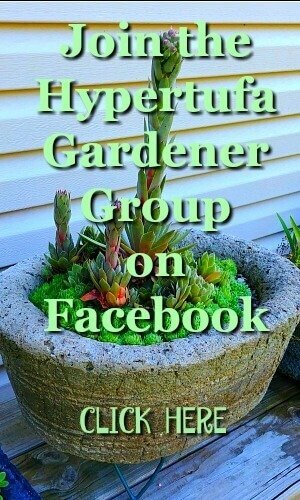 ← Unconventional Hypertufa Hanging Pots….or I’ll Try Anything! 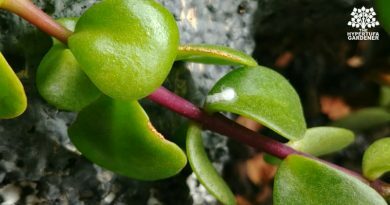 Mealybugs – Emergency! Invading Cotton Balls! 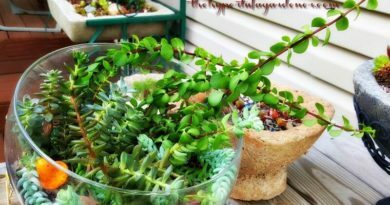 Growing Succulents In Terrariums -Time To Go Outside!